This is a question that comes up all the time! In fact, one of our most visited blog posts, is a post about actor type – check it out! QUESTION: WHAT ARE THE MOST COMMON ACTOR TYPES? “Type” is one of my favorite things to talk about. There are certain aspects of it you can't change: If you're a coloratura soprano, you're probably not going to go out on alto belter roles. If you're a legit operatic singer, you're probably not going to do a lot of productions of American Idiot (though more and more performers are able to cover a lot of ground musically). 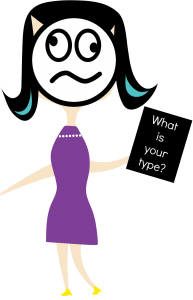 But “type” usually refers to things like physical types – are you the ingenue, or the soubrette, the comic relief/character actor, or the romantic lead? And to these, I greatly encourage you to think outside of the box. Sure, it's important to know whether you're an Ado or a Laurey; a Will Parker or an Ali Hakim. But there are going to be so many people saying no to you over the course of your career that I don't want you to be one of them. Look at it this way: Let's say you pour your talent through a funnel. The funnel is the number of people – casting directors, directors, choreographers, musical directors, producers – who are going to say no to opportunities. What comes out at the bottom are your opportunities. Shouldn't you start with as wide a funnel as possible? If a theatre is doing, say, five shows in their season and you only submit on one of them because that's the only one that fits your type, at most you're going to wind up with one job in that theatre's season. You – a prepared performer, who has trained on how to sing, how to act, how to dance. Who has put in all of the work necessary to build your vocal palette; to bring depth and shade to a character. You will – at most – book one job in that season. But what if those other four shows have roles that you'd be right for, if only someone was able to see you in them? Well, let them see you in them! Don't say “no” for other people. Prepare for those roles, as well, and go in and give them you. The number of times that theatres go against type is astounding. So yes, it's important to know what your type is, but it's also important to know what you can do, and how that might fit into roles that don't traditionally fall within your type.